​Compare Planter Kits: EarthBox, Garden Patch or AeroGarden? It will provide you with year round fast access to delicious fresh herbs of your choice not exposed to herbicides or insecticides. You will grow your herbs without the hassles of digging or pulling weeds. In the long run, it will save you plenty of money. If you do it indoors, it will create fresh air in your home and a beautiful environment with nice scents. Last but not least, it will give you something fun and useful to do in your spare time. Indoors, you could do it in your kitchen, on window sills or anywhere with adequate light. Outdoors, you could do it on balconies, porches, decks, as well as in yards and gardens. Planter kits come in various shapes, styles, and sizes. When you choose yours, it is important to select one with large enough pots to support your herbs even when they are fully grown and bushy. Also if you don't want to cause a water mess, make sure the kit you select is equipped with adequate drainage for excess water. The drainage tray should be wide and deep enough to avoid any spillage. A better option that does not even require a drainage tray is getting a self-watering herb growing kit which avoids spillage related problems. Self-watering kits have an additional major benefit: the pot comes with a small built-in reservoir which is filled with water, and the plant absorbs the water at the rate it needs. Because different plants have different water absorption needs, this feature is quite helpful in achieving proper growth. We will review and compare here the most popular planter kits bought by Amazon customers for growing herbs at home. Three popular products are presented below. They are the Garden Patch, Miracle-Grow AeroGarden Classic 6 and EarthBox kits. Note that some of these can be used not just to grow herbs, but also various vegetables. Following the descriptions, a comparison and recommendations are provided to help you make the right choice. The AeroGarden Classic 6 planter kit costs quite a bit more than the other brands described here, but it is no doubt the most sophisticated, stylish, no-mess compact herb growing kit available on the market. It can grow not just herbs, but other plants as well. What is special with this kit is that no soil or natural light is needed! Therefore, even low-light spaces can be used to grow your plants. ​You can grow up to 6 plants in this garden and they’ll love the high performance, energy efficient LED lighting tuned to the specific spectrum that allows plants to maximize photosynthesis, resulting in rapid, natural growth and abundant harvests. ​Note that AeroGarden planter kits are known as the world’s leading indoor gardening systems. Thanks to advanced hydroponics, up to 6 plants at a time can be grown in water (not in soil), 5 times faster than in soil. It uses soil-free seed pods. It has a built-in and energy-efficient plant-lighting system (known as Grow Lights) that allows herbs and plants to grow anywhere with no need for natural sunlight. It automatically turns on and off the lights as needed. The high-performance, full spectrum 20-Watt LED lighting system is tuned to the specific spectrum that allows plants to maximize photosynthesis, resulting in rapid, natural growth and abundant harvests. The LED lights concentrate daylight white LEDs for fast growth, blue LEDs for bigger yields, and red LEDs for more flowers and fruit. With ideal lighting and optimally balanced levels of water and nutrients, plants grow up to 5 times faster than when grown in soil. The unit measures (16x11x15) inches, and it comes with just about everything an "indoor farmer" may need. It is also equipped with an easy-to-use Control Panel which can be used to automatically create optimal conditions for your plants by turning Grow Lights on and off and by regulating water and nutrient delivery as needed. It comes with 6-Pod Gourmet Herb Seed Kit that contains: Genovese Basil, Curly Parsley, Dill, Thyme, Thai Basil and Mint. In addition, 3 oz. of patented nutrients are included (enough for a full season of growth). It has a compact, triangular shape that is a perfect fit for kitchen countertops and tight corners. It can be set up in minutes without tools. You just need to insert the Seed Pods in your garden, add water and nutrients, and then watch it grow! Everything you need to start growing is included. Imagine fresh herbs and vegetables grown in your home, year-round. With the AeroGarden Classic 6 you can grow fresh herbs, vegetables, salad greens, flowers and more! This smart countertop garden uses only water and patented nutrients to naturally grow plants: no herbicides, no pesticides, non-GMO. The EarthBox kit (and the Garden Patch Grow kit that will be described in the next section) differentiates itself from the kits described above in that it is more suitable to use on porches, balconies, decks, gardens and courtyards, even though it could also be used indoors where there is appropriate light. The reason is that it is larger and aesthetically not as decorative as the other kits presented above. However, the big plus with this kit is that it is designed to grow not just herbs, but all kind of plants, and in much larger quantities. The EarthBox is 30-inch long, 13.5-inch wide and 12-inch high, and it has a reservoir that can hold 3 gallons of water. Plants absorb the exact amount of water they need from the reservoir, so over-watering is not possible. You just need to make sure that there is always water in the reservoir. The box rests on four wheels and can easily be moved around. It is a maintenance-free growing system that controls soil conditions and eliminates guesswork, so plants can grow faster and better. 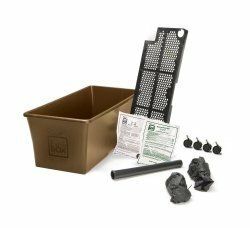 The growing kit includes an EarthBox container, an aeration screen, a water fill tube, two reversible germination covers for jump-starting your garden, fertilizer and dolomite and an instruction sheet. To get going all you need to do is add planting mix, seedlings and water. Almost any brand of peat-based planting mix for containers or hanging plants can be used. The box is UV protected. As mentioned, this kit is great for cultivating not just herbs but various types of vegetables such as tomatoes, peppers, eggplants, and cucumbers, as well as flowers. Note however that while you may also experiment with root vegetables, because the limited depth of the box, you may not get a substantial yield like you would normally with above-ground vegetables. 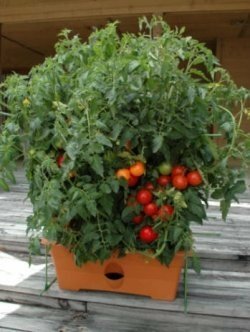 Like the EarthBox previously described this product is also more suited to people who wish to grow not just herbs, but all kinds of vegetables, and not just indoors, but even more so outdoors, on porches, balconies, and decks, as well as in yards and gardens. It is 28-inch long, 14-inch wide and 12-inch high, and it has a reservoir that can hold 4 gallons of water. It has 42 liter soil capacity (1.5 cubic feet). The large filling hole on the side of the box makes it easy to fill the reservoir and check the water level. The right amount of water is automatically provided to the plants as needed. It is impossible to over-water the plants. The product also comes with a nutrient patch cover that automatically releases premium fertilizer, stops weeds, properly spaces the plants and keeps the correct temperature. Air enters from the top and bottom to prevent fungus, root-rot and disease. A simple potting mix is used for green-house quality results. The box is UV protected and comes with simple instructions. As mentioned, this products will let you grow not just herbs, but a variety of plants, including tomatoes, onions, peppers,berries and even flowers. Note that the box is not equipped with wheels so moving around the box is harder than with the EarthBox box. On the other hand its water reservoir is larger than EarthBox's, and thanks to its large hole on the side of the box, filling it and checking the water level is easier. So which Planter Kit should you get? EarthBox and Garden Patch presented above are suitable for not just growing herbs, but other vegetables as well. They are equipped with sophisticated watering and drainage systems and provide more growing space for the plants. Note that both of these products provide the self-watering feature which eliminates water excess related messes and provides water to the plants as needed. ​So, if you wish to grow large quantities of herbs and other vegetables, and you want to be worry free of watering and drainage problems, these are the products you should be considering. On the other hand, these two products are not as decorative as the AeroGarden kit, and customers usually use them on their porches, decks or balconies, or in their yards or gardens, rather than indoors. But they could also be used indoors where the light is adequate. -> So, if you are interested in worry-free cultivation of lots of herbs and other vegetables, and you prefer to grow them on decks, balconies, porches or in yards and gardens, then you should definitely consider the EarthBox and Garden Patch kits. The AeroGarden Classic 6 kit is stylish, and therefore it can be used inside the home, and it allows the cultivation indoors of large quantities of herbs, and even other plants such as cherry tomatoes, chili peppers, edible flowers, etc. It can be placed even where the lighting is not adequate as it generates it's own light! It provides a worry-free, sophisticated, no dirt, microprocessor based environment that creates ideal growing conditions for each plant. -> So, if you want to grow lots of herbs and other vegetables indoors, you are looking for the latest and greatest that technology offers for worry-free indoor cultivation, and finally you don't mind paying a bit more, then you should definitely consider the AeroGarden kit. You will find below, on Amazon, the planter kits for growing herbs at home described in this review. Please click the selected planter kit to check the price or to purchase. When you click AeroGarden, you will be offered a choice of two colors.